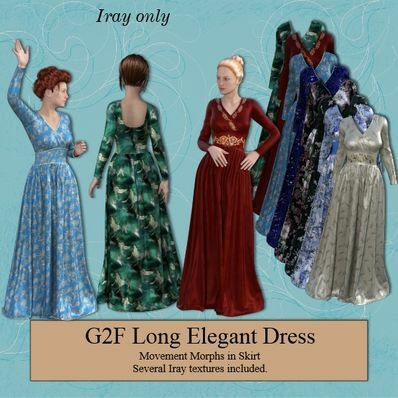 Long Elegant Dress for Genesis 2 Female for use in Daz Studio 4.8. Movement Handles included. I have also included several Iray Textures. Downloading! Thank you so much for sharing. Thanks for this lovely gown. I have seen a few renders of the Long Elegant Dress which have the feet in a high heel or tip toe pose. Please make sure the feet are in a flat pose, as the hem of the dress should be touching the floor NOT 2 inches above. It looks silly like that. Like, color is very beautiful, thank you! Fabulous, thank you so much. Very nice Dress! Thank you so much, Wendy! Super-pretty! Thanks so much, Wendy! Thanks Wendy. Beautiful as always. Thank you for continuing to support G2F!! Thank you for another lovely creation. Thank you very much for this lovely long dress! I can see this one in many settings! It is absolutely gorgeous! Thank you BIG TIME, Wendy! You outdid yourself on this one, Wendy! It's gorgeous! Thank you so much! What a gorgeous gown, the textures are so perfect. Love the lines in this gown. Love the draping at the bottom of the gown, it is so realistic, so real world. You're the BEST!! gorgeous! thank you a lot!